We love our local toy store. While I do shop at national chains, I also spend much of my time visiting our local toy store. Partly I love that I’m supporting the local guy but I also like seeing some of the more unique toys and lines that they offer that I can’t find at our national stores. 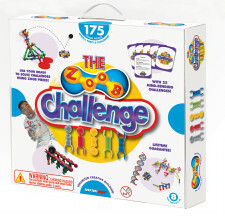 I actually got my kids some Zoob toys (see the image) at our local store last year and they still love it. The American Specialty Toy Retailing Association (ASTRA) also has a great list of the Best Toys for Kids. Makes your holiday shopping a little bit easier, right? You can persue their list online and you can also check out some of the toys this Saturday, November 10th but visiting your local toy store to support Neighborhood Toy Store Day. I thought this was a cool fact: According to the 3/50 Project, for every $100 spent in local, independently-ownedstores, $68 returns to the community in the form of taxes, salaries, charitable contributions and more in contrast with only $43 when consumers spend their money at a national chain. Many participating independent toy stores across the country will be hosting in-store events to celebrate the day like having performances, crafts for the kids, snacks, prizes and special discounts. Visit YourNeighhorhoodToyStore.Org and search their calendar to see if your local toy store is participating. About ASTRA Founded in 1992, the American SpecialtyToyRetailing Association (ASTRA) is a non-profit organization that provides leadership and resources to grow the specialtytoyindustry. As the largest association serving the specialtytoyindustry, ASTRA members include independenttoyand childrens product retailers, specialtytoymanufacturers and industry affiliates. For more information on ASTRA, please visitwww.astratoy.org.